I try to be careful about adding sources and dates to all the pictures. The names of the garments shift and depend on the country. I try to writte the different veriations that I find, the English names, quite often the latin ones and the french ones are there as well and the Danish names in parenthesis. I am still learning so I might misname thing – this is a work in progress and I update it as I learn more about the period. Women would wear a shift, a dress called a cote or a kirtle over that they would often wear something else either a surcote or a robe of some sort. 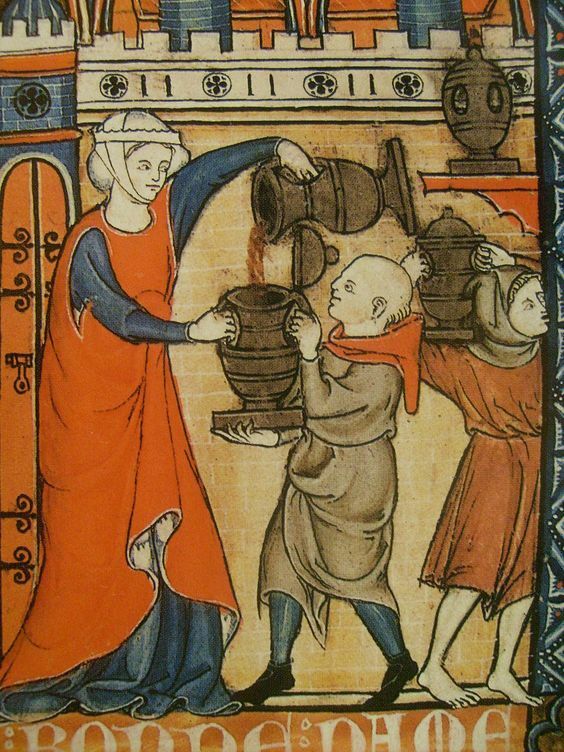 Grown women would almost always wear some kind of head cover (read more) either a viel, coif or hood of some sort. Below I have tracked the changing fashion and focus in on particlar peices of clothing with lots of pictures. I update this as I find more infomation. Women would wear chemise or shift (særk), which could have long sleeves, short sleeves or shoulder strops. The length could vary. More often than not the chemise was made from uncolored and unbleached linen. Around the mid 1300’s the cote became a fitted garment along with the more fitted outer garments. From mid-1300’s the cote would buttoned or laced either in front or in the sides. The cote might only have short sleeves and be worn with the chemise showing or loose sleeves pinned over the chemise. Over their cote aristocratic would often wear another layer. The nobel ladies’ surcotes (surkot) could be richly decorated and made from costly fabrics. Some of the designs are also quite advanced. The dress would be to the floor, perhaps with part of the dress raised to show off the tunic underneath. Dresses could also have long trains that would require an assistant to help you move around in them. The surcote would often function as outerwear as well. 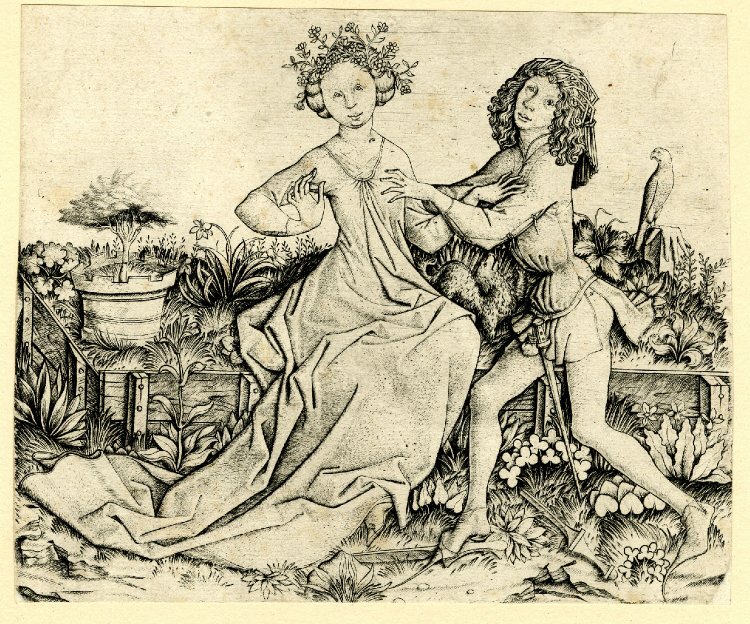 Two woman wearing kirtles with surcotes over. Both have pulled up their surcotes to show off their kirtles of a different color. The kirtles have white coffs. 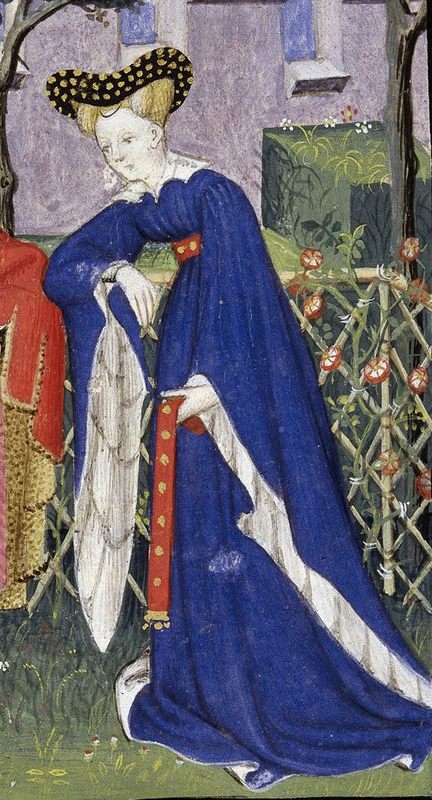 Long trimmed gowns of the 1480s are carried looped up to allow walking, displaying the kirtle beneath. 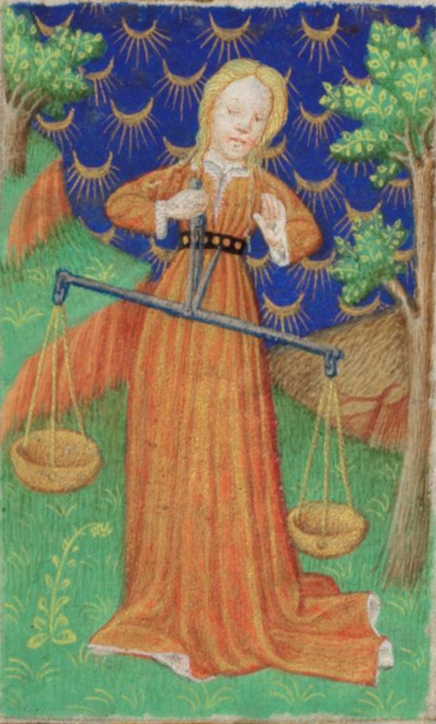 Over time the cyclas developed into the Surcot(e) ouverte and were popular from the mid 1300’s until the 1500’s as a symbol of rank among the noble women. 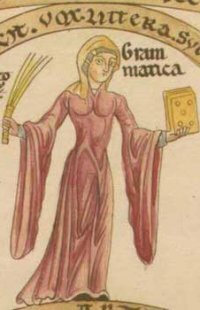 The surcote ouverte was a woman’s sleeveless outer garment, with armholes that deepened towards the hips in the middle of the 1300’s. Retained as a symbol of rank for aristocratic women into 1500’s. 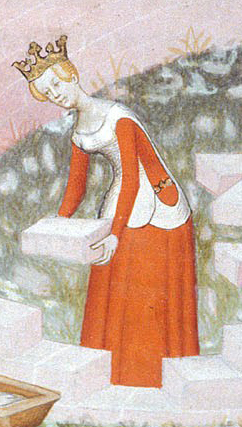 Characterized c.1400 and later by huge sleeves often falling to the floor. 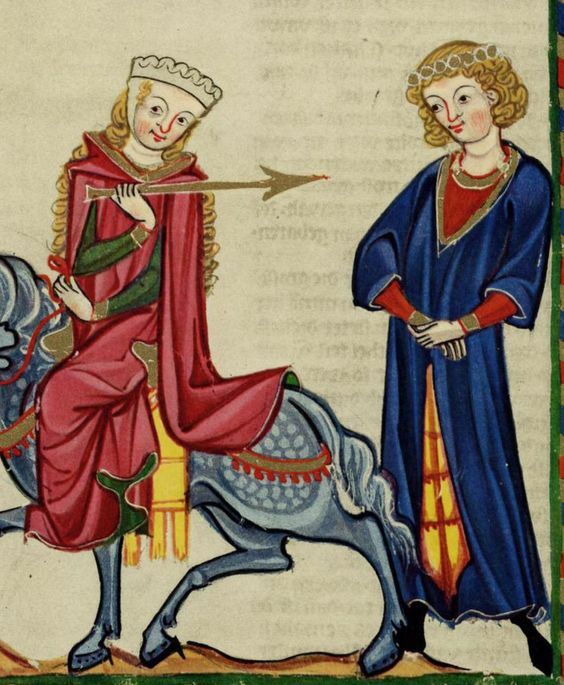 Over time the cyclas developed into the Pellote and Surcote ouverte and were popular from the mid 1300’s until the 1500’s as a symbol of rank among the noble women. 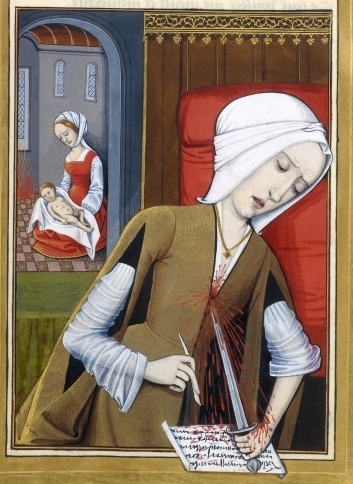 The pellote was a woman’s sleeveless outer garment, with very large armholes trimmed with fur. The open sleeved surcote is fitted around the body and has a loose skirt. The sleeves are fitted till the elbow where the sleeve is cut open and hangs from the arm showing off the cote underneath. It has many of the same characteristics of the bliaut of earlier periods. The ends of the long sleeves are, like on the hoods, called liripipe. 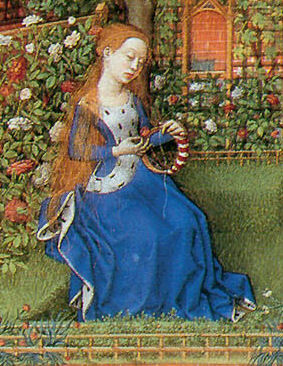 Fur-trimmed Burgundian gown of mid-15th century has a V-neck that displays the black kirtle and a band of the chemise. 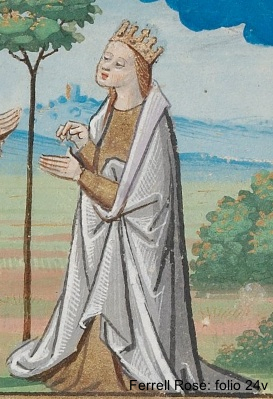 Hair is pulled back in an embroidered hennin and covered by a short veil. ca. 1455. 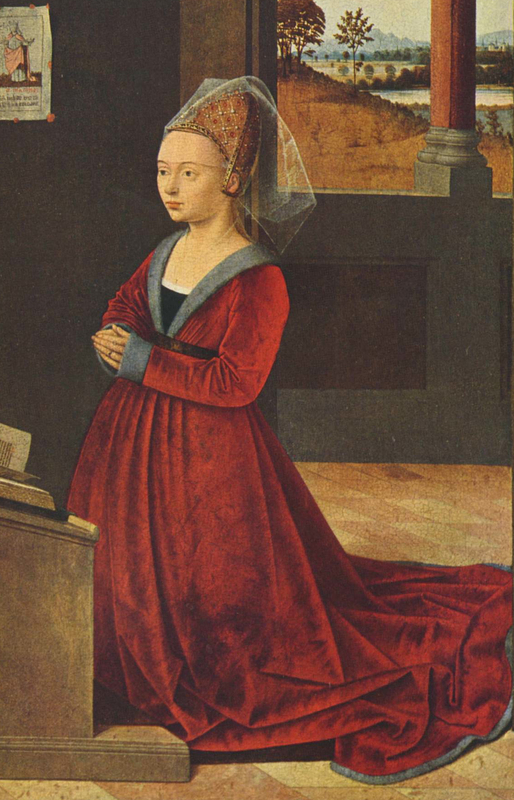 Around 1430 the houppelande fell out of fashion again and robes were in again. The sleeves was narrower again – it would seem they became very fitted and large manchets were added to the sleeve. The neckline is v-shaped, often furtrimmed and shows up the cote underneath and normally a small bit of the chemise as well. The ladies would wear their dresses long enough to have trains. Unless they had someone to handle the train they would wear it over an arm if outside. MS Douce 195 pg 18 by Guillaume de Lorris and Jean de Meung, French, late 15th century. Germany and bohemia: The gowns was still short waisted and tight-laced but not corseted. The front of the gown was open-fronted laced over a kirtle or had an insert of a stomacher or plackard. The sleeved were puffed and slashed or had elaborate cuffs. France, England and Flanders: The high waistline gradually moved toward natural waist in the front and toward a V-shaped point. Large trimmed cuffs came in fashion. Denmark: I wonder if we followed the German or France fashion? German fashion: Anna Cuspinian wears a rose-pink brocade gown with a high belt and black collar and cuffs with a large headdress 1502–03. German fashion: Katharina von Bora wears a front-laced grayish gown with black trim. She wears a white partlet edged in black, and her hair is confined in a net or snood, 1526. Anne Stafford wears a black fur-lined gown with turned-back sleeves over a dark kirtle. She wears a soft sash at her waist and a sheer partlet over a square-necked chemise, c. 1535. A lot of different kinds of cloaks, capes and mantles were used as well as surcotes and robes. For more partical outerwear you would wear a short cape with or without a hood. 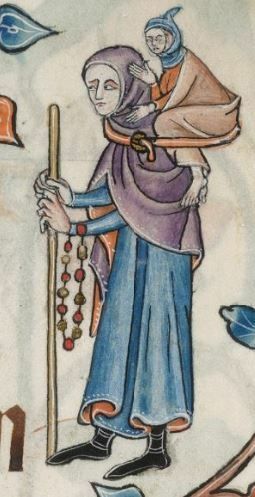 Pilgrim wearing a hooded purple chape over a long blue cote. The chape is a short hooded cap that later developed into the liripipe. It is covering the head and shoulders with a hole was cut in the fabric to frame the face. A mantle was a loose outer garment or cloak cut in the round, open down the front and fastened either on the shoulder or in front; used by both men and women. It was often worn in a ceremoniel or representative capacity.